Mark Zuckerberg wants to save the world; Uber wants to save itself; CMO tenure is down; marketing budget plans for digital channels; Facebook and Oculus are trying to figure out what they are; Snap continues to prepare for its IPO; no more free WSJ articles via Google search; how companies are preparing for innovation strategies; thoughtful ideas about AI in our society; the signs and symptoms of email fatigue; Cisco's 2017 cybersecurity report; enterprise influencer marketing success; building a connected workforce; and more in this week's edition of The Full Monty. And don't forget to check out The Full Monty podcast. If journalism was in a crisis with the rise of digital publishing, it's got another challenge on its hands in the post-truth era. Between the generation gap in news consumption, the proliferation of news outlets, and the growing distrust in any establishment media organization, journalism is in a fight for its life. When a politician in Colorado declared a local paper was "fake news," the news outlet threatened to sue over defamation. When an entity deals in information and a public figure calls into question its very credibility simply because they don't like what's being said — not because of a dispute over facts — that's an erosion of the free press. The new crisis that companies are preparing for: tweets targeted against them by Donald Trump. Some companies have drafted plans for war rooms to address potential criticism, while others are focusing on promoting job creation and U.S. investments. What a strange era we live in, when companies have to fear the President of the United States. Meanwhile, John Oliver is trying a very different kind of targeting. Because he knows which shows the president watches (which does not include his own show), Oliver is buying advertising on the morning shows in the Washington area. Great lessons for brands here on knowing your audience and targeting appropriately, rather than waiting for them to come to your site. Utility companies are often the target of consumer ire. And where do consumers go to express their dissatisfaction? Why, social media, of course! Which is why a number utility companies are increasingly turning to social media for reputation management. Giphy is using its platform for good: in this case, Giphy is teaching hearing people American Sign Language. Amazon is getting into the video conferencing and communications business with the launch of Chime, a paid service that is currently limited to two parties. Ad Age reports on statistics about CMOs: they have the shortest tenure of any function in the C-suite, and about half of the tenure of CEOs. Which channels are marketers going to be investing more – and less – in this year? 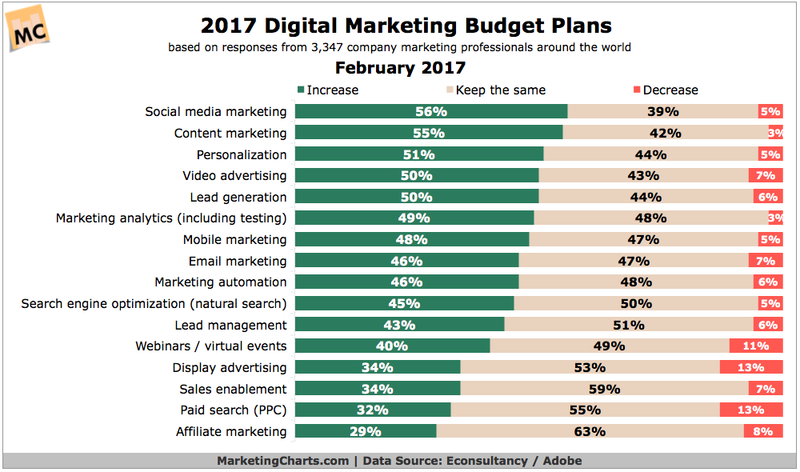 A review of studies from Econsultancy and Gartner offers a window into marketers’ plans for this year. Social media may be ripe for more budget. Twitter plans to pare down three ad products, including legacy TellApart business, the firm's direct response business, and aspects of Promoted Tweets. Great! Now how about paring down the time your half-time CEO spends on his second job before there's no more Twitter left? Mark Zuckerberg laid out his vision for Facebook's role in the future. Essentially, he wants to use Facebook to save the world. In this vision, he outlines a role as a social change agent for issues like increasing voter turnout worldwide and preventing terrorist attacks. The manifesto focuses less about the products themselves, and rather the challenges facing the world and Facebook's ability (and responsibility) to do something about them. Facebook is now at a scale where it can make significant impacts on society and behavior. It's leadership is imperative. Facebook will now allow businesses to post job listings on their Pages. Look out, LinkedIn! Also, it's another angle toward gaining ad revenue. Next stop, television: Facebook is working on a standalone TV app that will allow users to watch their friends' videos on their televisions. Speaking of video, autoplay videos on Facebook will now autoplay with sound. This won't be annoying at all. Facebook's AI will be able to find photos based on seeing what's in them. WhatsApp adds a status feature that will disappear after 24 hours. A feature that lets you post photos and videos that disappear after 24 hours. Where have we heard of that before? Yes, it's another swipe at Snapchat. Is it a social network, a technology company, a media platform, or a social change agent? Facebook is going through an identity crisis. Snap is on its IPO roadshow. The New York Times has five key takeaways from Snapchat's 35-minute roadshow video. They include: it's more than an app company, it's nostalgic, and its community is nice. The difference between winners and losers in public tech companies boils down to exactly what Snap needs to determine: is it a platform or a product company? Scarcity, choice, intimacy and privacy are what make Snapchat's Lenses a genius ad product. Small and midsize businesses may not be able to afford the large ad prices on Snapchat, but they do have access to tools to create their own custom geofilters. Spectacles are now available to purchase online, for $130. Google has ended its "First Click Free" arrangement with the Wall Street Journal which gave non-subscribers access to up to three articles a day on WSJ.com. Evidently, subscription numbers have increased and the WSJ doesn't need the additional traffic. We often share WSJ.com links here; we'll try to be mindful and share links to stories about the same topics from other sites. Google Maps launched Lists, a way to create and share your favorite places. Being able to create and share lists of places could give Google Maps a more social feel to it. The unskippable 30-second spot on YouTube is gone. YouTube finally realized that it's not television. Verizon took a $350 million discount on the Yahoo deal, after Yahoo disclosed two major security breaches. The deal now stands at $4.48 billion. With Yahoo and AOL together, the challenge is on for which users hold the moral high ground on least relevant email URL. Crowd Companies has created a report that showcases how companies are preparing for, maintaining, and achieving success in their corporate innovation strategies. It includes research findings on corporate innovation leaders, as well as 10 innovation program models (outposts, labs, accelerators, intrapreneurship, and more), including how to select the right models for your corporation. Airbnb is being sued by landlord AIMCO, one of the largest owners and operators of apartments in the United States. Their contracts expressly forbid short-term leases and the lawsuit claims that Airbnb is helping tenants violate their leases. Airbnb bought Luxury Retreats in its biggest acquisition yet, as it takes steps toward becoming a full-service global travel company. A female engineer told a harrowing tale of sexual harassment, HR threats, and a dwindling percentage of women engineers at Uber. It's an explosive post that goes into great detail about the situation. The company has appointed former U.S. Attorney General Eric Holder to lead an independent investigation. A drivers' strike in India is crippling Uber and local favorite Ola. Lyft has it. So to taxis. So why won't Uber implement a tipping option? The company says riders appreciate that the app is hassle-free. Well, except for that part when I have to go back into it after a ride and leave a rating/review — a perfect time to also add a tip, wouldn't you agree? Tennessee, Maryland and Illinois are considering implementing Safe Autonomous Vehicle acts, which allow only automakers to test autonomous vehicles — a move that is unfair to autonomous vehicle technology companies such as Waymo and Uber. If you're in Dubai this summer, you may have an opportunity to try an autonomous, one-passenger drone taxi. That's right, flying cars have arrived. And no one is flying them. Automation will make us rethink what a "job" is. The bottom line: we must ensure that task automation does not merely reduce labor cost but also delivers increased performance for the human workers. Bill Gates says that if a machine takes your job, the machine should pay taxes. And then it will use machine learning to determine how to avoid paying taxes, no doubt. Similar to its parent company Facebook, Oculus may be having an identity crisis: is it a hardware manufacturer or a research company? Soundtrack Your Brand, a Swedish startup that wants to bring music streaming to businesses, has raised $22 million. The company is partially-backed by Spotify. Sources say that Facebook is in talks with record labels about licensing their music for the social network, positioning it as a competitor to YouTube, Apple and others. Program of the Week: This week's podcast is Good One: A Podcast About Jokes from New York Magazine. It's a limited-run podcast where comedians are brought on to deconstruct a joke in their repertoire. Do you have a program to recommend? Add yours to our Google Sheet: smonty.co/yourpodcasts. Pixar, the masters of animated storytelling, have opened a free Khan Academy course on storytelling. This Incredibles opportunity won't last long! Get Up and be Brave. Since it's online, you don't even have to get in your Cars to attend. A report on best practices in content marketing and why the age of infographics is dying. TopRank Marketing, along with influencer relationship management software company Traackr, teamed up to investigate how the practice of influencer marketing is evolving within leading enterprises around the world. So is it influencer marketing or influencer relationships? 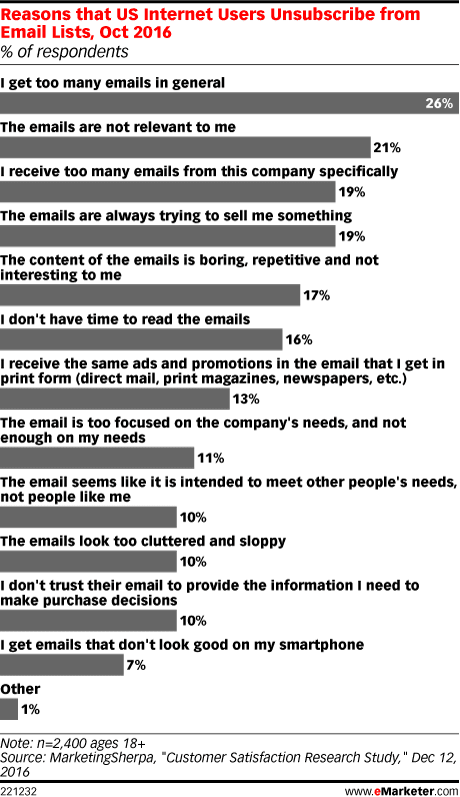 Are your customers getting email fatigue? Symptoms are too many emails overall and from your company which are irrelevant and try to sell them something all the time. Cisco released its 2017 Cybersecurity Report, which indicated that over one-third of organizations surveyed that reported a breach in the last year, said that they experienced significant customer, opportunity, and revenue loss. A hacker has released 1.3 million accounts from staffing platform Elance. Sometimes, lax security doesn't take a hacker: last weekend, President Trump used phone flashlights to view briefing documents in a public space. If you stream Live videos publicly on Facebook, your videos can legally end up on TV. An official watchdog in Germany has told parents to destroy a talking doll called Cayla because its smart technology can reveal personal data. "I'm Talky Tina, and I don't like you." One of the most vital elements in content marketing success is data. A superb example of confirmation bias and how not to structure a survey if you want it to be neutral and statistically significant. The "soft stuff" like thought leadership is notoriously difficult to measure. You just have to know what to look for. Even comic book sites aren't free from controversy, as The Beat found that merely 30% of comic news sites' news was news about comics. An interview with GE Digital's Bill Ruh, a thought leader on the future of the industrial internet. By 2018, 70 percent of siloed digital transformation initiatives will ultimately fail because of insufficient collaboration, integration, sourcing, or project management. So here's how to build a connected workforce. Do you like wine? Do you like your cat? Now you can enjoy both as you bring your cat to happy hour.